1 Bless the LORD, O my soul! O LORD my God, You are very great: You are clothed with honor and majesty, 2 Who cover Yourself with light as with a garment, Who stretch out the heavens like a curtain. 3 He lays the beams of His upper chambers in the waters, Who makes the clouds His chariot, Who walks on the wings of the wind, 4 Who makes His angels spirits, His ministers a flame of fire. 5 You who laid the foundations of the earth, so that it should not be moved forever, 6 You covered it with the deep as with a garment; the waters stood above the mountains. 7 At Your rebuke they fled; at the voice of Your thunder they hastened away. 8 They went up over the mountains; they went down into the valleys, to the place which You founded for them. 9 You have set a boundary that they may not pass over, that they may not return to cover the earth. 10 He sends the springs into the valleys; they flow among the hills. 11 They give drink to every beast of the field; the wild donkeys quench their thirst. 12 By them the birds of the heavens have their home; they sing among the branches. 13 He waters the hills from His upper chambers; the earth is satisfied with the fruit of Your works. 14 He causes the grass to grow for the cattle, and vegetation for the service of man, that he may bring forth food from the earth, 15 And wine that makes glad the heart of man, oil to make his face shine, and bread which strengthens man’s heart. 16 The trees of the LORD are full of sap, the cedars of Lebanon which He planted, 17 Where the birds make their nests; the stork has her home in the fir trees. 18 The high hills are for the wild goats; the cliffs are a refuge for the rock badgers. 19 He appointed the moon for seasons; the sun knows its going down. 20 You make darkness, and it is night, in which all the beasts of the forest creep about. 21 The young lions roar after their prey, and seek their food from God. 22 When the sun rises, they gather together and lie down in their dens. 23 Man goes out to his work and to his labor until the evening. 24 O LORD, how manifold are Your works! In wisdom You have made them all. The earth is full of Your possessions — 25 This great and wide sea, in which are innumerable teeming things, living things both small and great. 26 There the ships sail about; there is that Leviathan which You have made to play there. 27 These all wait for You, that You may give them their food in due season. 28 What You give them they gather in; You open Your hand, they are filled with good. 29 You hide Your face, they are troubled; You take away their breath, they die and return to their dust. 30 You send forth Your Spirit, they are created; and You renew the face of the earth. 31 May the glory of the LORD endure forever; may the LORD rejoice in His works. 32 He looks on the earth, and it trembles; He touches the hills, and they smoke. 33 I will sing to the LORD as long as I live; I will sing praise to my God while I have my being. 34 May my meditation be sweet to Him; I will be glad in the LORD. 35 May sinners be consumed from the earth, and the wicked be no more. Bless the LORD, O my soul! Praise the LORD! Psalm 104 praises God for His mighty works in creation and speak of God’s design in creation as described in Genesis 1 and 2. One thing which was a part of God’s design — either at creation or following the Genesis Flood — was to tilt the earth on its axis to give us the seasons of the year (cf. Gen. 1:14 and Gen. 8:20-22). How different would the world be without seasons? How do the seasons flow together for our good and benefit? How does the psalm describe God’s creation of the heavens and the earth (v. 1-9)? Compare this with Genesis 1:1-10. How are these accounts similar? How does the psalm describe the angels? See v. 4. What does Hebrews 1:14 tell us of the angels? Compare Psalm 103:20-21. Read verses 10-24. How does God’s design in creation, the seasons, the rains, the creation of day and night, work together to make God’s creation wonderful and work together for good? Compare Genesis 1:11-19.
Who waters the earth and feeds and nourishes all of creation? How? Consider the spring plants and how they grow? Who brings all this about? And, how does it work together for our good? Read verse 24. How is this true? Is God’s design in creation simple, or complex with interdependence and, of course, full dependence upon the Creator built in? Compare Neh. 9:6; Heb. 1:1-3. What about the seas? Read v. 25-30. Do we depend on them? What do the seas tell us about the Creator? What is the great Leviathan? Do we know for certain? Read Genesis 1:20-25. Does this sound similar? How? Who gives food to all the creatures? What happens when God withholds His hand? When He takes His spirit from His creatures? Compare Genesis 3:19; Ecclesiastes 3:20-21; 12:1-7.
Who gave life in the beginning? Compare Genesis 1:26-28; 2:7 with Psalm 104:30. What does the psalmist say of the Lord in v. 31-32? What does the psalmist say he will do in v. 33-34? How long will he continue to do this? What about us? How can our praises and the meditation of our hearts be acceptable to the LORD God who made us and redeemed us? Compare Psalm 51:14-15; 66:18; Psalm 32:1-11; Ephesians 1:6-7; 1 John 5:11-15. What does the psalmist pray in v. 35? Is this a fitting prayer that we can pray? Do we ever pray the same thing? Why? Compare Matt. 6:10a; 2 Pet. 3:9-10; 2 Thess. 1:3-10; Rev. 22:20. Sing LSB 804: “O Worship the King.” How does it reflect the words of Psalm 104? Read Together in unison Psalm 100 (NKJV) A Psalm of Thanksgiving. 1 Make a joyful shout to the LORD, all you lands! 2 Serve the LORD with gladness; come before His presence with singing. 3 Know that the LORD, He is God; it is He who has made us, and not we ourselves; we are His people and the sheep of His pasture. 4 Enter into His gates with thanksgiving, and into His courts with praise. Be thankful to Him, and bless His name. 5 For the LORD is good; His mercy is everlasting, and His truth endures to all generations. 1. See v. 1-2. What does this psalm call upon us to do? To whom does this call extend? How do we do this? 2. See v. 3. What are we to know? Who is the LORD? What does it mean when our Bibles capitalize the word LORD (YHWH in Hebrew)? Read Deuteronomy 6:4 – How many Gods is the LORD? Read Matthew 28:19 – How many Persons are in the Godhead? 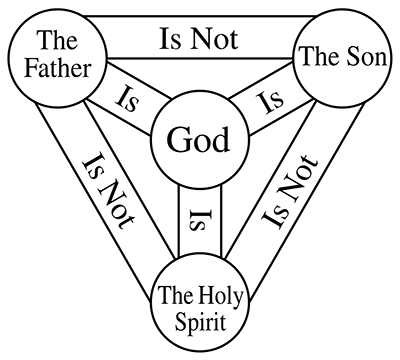 Read 1 John 5:7 (KJV or NKJV) – What does this verse say about the Triune (three-one) God? Read Isaiah 48:16-17 – Who is speaking? Who sent Him and speaks by Him? 3. Cf. Isaiah 44:24; Nehemiah 9:6; Genesis 1 & 2, John 1:1-5; Hebrews 1:1-3. What do these verses teach us about who made us and to whom we belong? 4. Read Psalm 139:13-16. How did God create each of us? 5. How else are we like sheep? Read Isaiah 53:6a. What has God done to bring us back into His fold? Read Isaiah 53:6b; John 3:16; 10:11; 1 Peter 1:18-19; 2:22-25. Read Isaiah 44:22. For whose sake has the LORD blotted out our sins? Cf. 1 John 2:1-2. 6. If the LORD God made us and redeemed us by sending the Son into the world to die in our stead as a sacrifice for our sins and the sins of the entire world, are we our own or do we rightly belong to Him? 7. What does the Apostle Paul say is a fitting response for us when we come to know and trust in God’s grace and mercy in Jesus Christ? Read Romans 12:1-2. How do we do this? 8. Read v. 4. What are we entreated to do in this verse? What does this mean and how do we do this? 9. Why do we do this? Read v. 5. How is the LORD good to us? Does His mercy ever run out? Why? Read Psalm 108:4; John 1:14; 14:6. What is His truth and how does it endure to all generations? Does it remain true even yet today for us, our children, our grandchildren? 10. What important truths have you learned from this study? Write a brief summary and, going around the table or room, share it with others. “Old 100th” or “Old Hundredth” (also commonly called “Old Hundred”) is a hymn tune in Long Metre from Pseaumes Octante Trois de David (1551) (the second edition of the Genevan Psalter) and is one of the best known melodies in all Christian musical traditions. The tune is usually attributed to the French composer Louis Bourgeois (c. 1510 – c.1560). Although the tune was first associated with Psalm 134 in the Genevan Psalter, the melody receives its current name from an association with the 100th Psalm, in a translation by William Kethe entitled “All People that on Earth do Dwell.” The melody is commonly sung with diverse other lyrics as well. Without our aid He did us make. We give you thanks and praise, O LORD God, for creating us and giving us life, for redeeming us through the holy life and innocent sufferings and death of Your Son Jesus Christ, and for bringing us to faith in our crucified and risen Savior through Your Word and Sacraments. Graciously keep us in the true faith unto life everlasting. Amen. 1. Who is God and what does the Bible tell us about Him? Isaiah 42:8: I am the LORD: that is my name. Jeremiah 10:10: But the LORD is the true God, he is the living God, and an everlasting king. Psalm 90:1-2: Lord, thou hast been our dwelling place in all generations. Before the mountains were brought forth, or ever thou hadst formed the earth and the world, even from everlasting to everlasting, thou art God. The true God is the LORD God – or Jehovah God – of the Bible. He is the living and eternal God who always was, who is and always will be. 2. How many true Gods are there? How many Persons are true God? 1 Corinthians 8:4: There is none other God but one. Matthew 28:19: Go ye therefore, and teach all nations, baptizing them in the name of the Father, and of the Son, and of the Holy Ghost…. 2 Corinthians 13:14: The grace of the Lord Jesus Christ, and the love of God, and the communion of the Holy Ghost, be with you all. Isaiah 48:16-17: Come ye near unto me, hear ye this; I have not spoken in secret from the beginning; from the time that it was, there am I: and now the Lord GOD, and his Spirit, hath sent me. Thus saith the LORD, thy Redeemer, the Holy One of Israel; I am the LORD thy God which teacheth thee to profit, which leadeth thee by the way that thou shouldest go. Numbers 6:22-27: And the LORD spake unto Moses, saying, Speak unto Aaron and unto his sons, saying, On this wise ye shall bless the children of Israel, saying unto them, The LORD bless thee, and keep thee: The LORD make his face shine upon thee, and be gracious unto thee: The LORD lift up his countenance upon thee, and give thee peace. And they shall put my name upon the children of Israel; and I will bless them. 1 John 5:7: For there are three that bear record in heaven, the Father, the Word, and the Holy Ghost: and these three are one. 3. What else does God tell us of Himself in the Bible? John 4:24: God is a Spirit: and they that worship him must worship him in spirit and in truth. Malachi 3:6: For I am the LORD, I change not…. Psalm 102:27: But thou art the same, and thy years shall have no end. Genesis 17:1: I am the Almighty God…. Matthew 19:26: With God all things are possible. Psalm 139:1-4: O LORD, thou hast searched me, and known me. Thou knowest my downsitting and mine uprising, thou understandest my thought afar off. Thou compassest my path and my lying down, and art acquainted with all my ways. For there is not a word in my tongue, but, lo, O LORD, thou knowest it altogether. John 21:17: Lord, thou knowest all things…. Jeremiah 23:24: Can any hide himself in secret places that I shall not see him? saith the LORD. Do not I fill heaven and earth? saith the LORD. Proverbs 15:3: The eyes of the LORD are in every place, beholding the evil and the good. Leviticus 19:2: I the LORD your God am holy. Isaiah 6:3: Holy, holy, holy, is the LORD of hosts: the whole earth is full of his glory. Deuteronomy 32:4: He is the Rock, his work is perfect: for all his ways are judgment: a God of truth and without iniquity, just and right is he. 2 Timothy 2:13: He abideth faithful: he cannot deny himself. Psalm 145:8-9: The LORD is gracious, and full of compassion; slow to anger, and of great mercy. The LORD is good to all: and his tender mercies are over all his works. Exodus 34:6-7: And the LORD passed by before him, and proclaimed, The LORD, The LORD God, merciful and gracious, longsuffering, and abundant in goodness and truth, keeping mercy for thousands, forgiving iniquity and transgression and sin, and that will by no means clear the guilty; visiting the iniquity of the fathers upon the children, and upon the children’s children, unto the third and to the fourth generation. 1 John 4:8: God is love. The Bible teaches us much about the true God. We call some of these qualities and characteristics of God the attributes of God. God, Himself, tells us in His Word that He is eternal, unchangeable, all-powerful, all-knowing, present everywhere, holy, just, impartial and fair, faithful, good, merciful, kind, gracious and loving. We believe that there is only one true God (Isaiah 44:6; I Corinthians 8:4). This God (called the LORD or JEHOVAH) is one divine Being or Essence, but three distinct Persons, the Father, the Son, and the Holy Spirit (thus the name, Triune or Three/One God), each being eternal and equal in power and majesty, because each Person is the LORD God (Deuteronomy 6:4; Matthew 28:19; I John 5:7; Isaiah 48:16-17; John 1:1; Colossians 2:9; I Corinthians 3:16; Hebrews 9:14; I Peter 4:14). We believe that no one can worship or serve the Triune God except he believes that Jesus Christ is the eternal Son of God and the Savior of mankind from sin and its consequences (John 3:18,36; 5:23; 14:6; I John 2:23; 5:11-12). Hence, all who deny the Trinity of God (that God is three Persons) or the Unity of God (that God is one divine Being), or who do not trust in Jesus Christ, the Son, for salvation, do not worship and serve the true God. 1. Why do we study the Bible? About what does it teach us? We study the Bible because it is the inspired Word of God and it teaches us about salvation through faith in Jesus Christ. Through the study of the Bible, we learn the true doctrine and teaching of God, and we are taught how to walk in His ways. 2. What is unique and special about the Bible? The Bible is special and unique because it is God’s Word to man. It was not written by the will of man. God Himself moved men to write and guided and directed them in the thoughts they expressed and in the words they wrote. 3. Does the Bible have mistakes and errors in it? All that the Bible teaches and says is true because it is inspired by God Himself and is His Word. 4. Has the Word of God been corrupted or lost? Not only did God give His Word by inspiration of the Holy Spirit. He has and continues to preserve His Word as a true and faithful witness to all the people in the world of salvation through faith in Jesus Christ. 5. What does God say about changing His Word – adding to it or taking away from it? 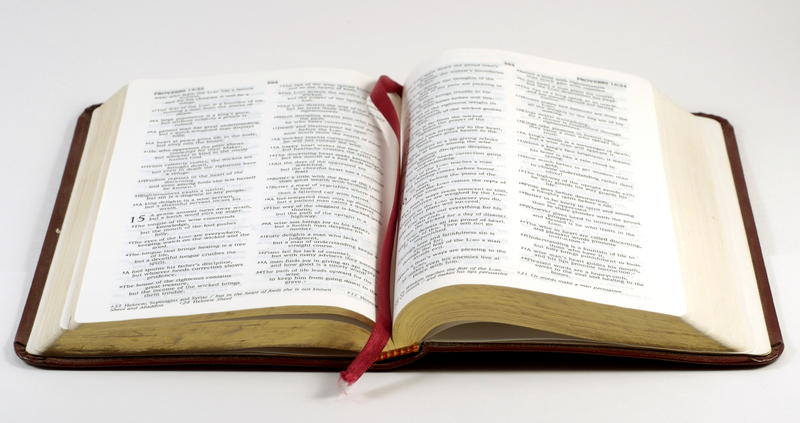 God forbids us to change His Word – to add to it or to take away from it. We are to speak and teach it faithfully. For this reason, we use great care to teach nothing more and nothing less than what God has revealed to us in the Bible. And we seek to use translations of God’s Word which are fully faithful to those texts which God has preserved and which have been widely used by the churches down through the centuries. 6. What use should we make of God’s Word? We should read and study the Bible, learn its teachings and meditate upon it because it is God’s Word to us. It teaches us of salvation through faith in Jesus Christ, God’s Son, and it also teaches us how to live for our Lord and Savior. Look in the front of your Bible at the listing of books there. You will find our Bible has a total of 66 books – 39 Old Testament Books and 27 New Testament Books. Memorize these books of the Bible in order so that you can easily find them when studying God’s Word. Also, memorize the Bible passages listed above – if you can, memorize them all – they are God’s Word and will help you learn of Him and grow in your faith in Christ Jesus. We believe that all of the Bible and each and every word of the Bible (the 39 Old Testament and 27 New Testament canonical books) were given by inspiration of God and are therefore the true and unerring Word of God (2 Peter 1:21; 2 Timothy 3:16; 1 Corinthians 2:13; John 10:35; 17:17; 2 Samuel 23:1-2). We also believe that the Word of God has not been lost or corrupted, but has been faithfully preserved by God down through the centuries as a witness to all the nations (Psalm 119:89; Isaiah 40:8; 1 Peter 1:25; Matthew 24:14,35). 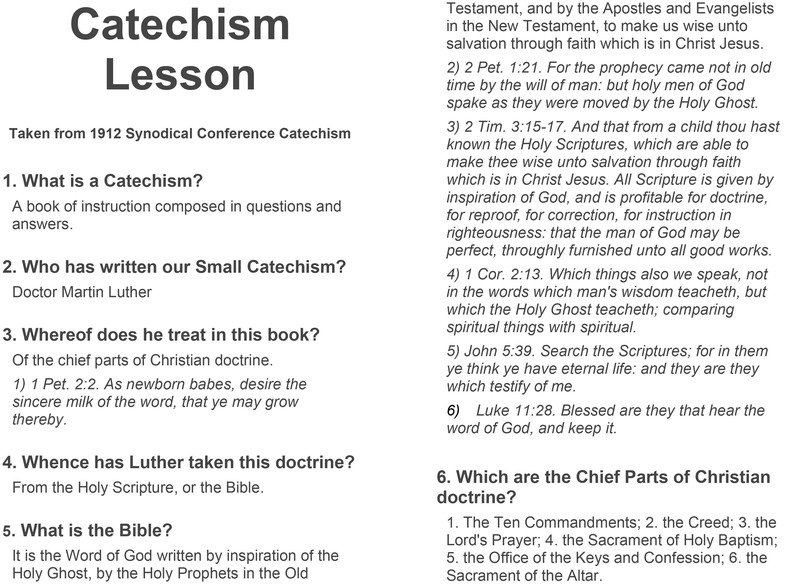 We believe that it is still accurately recorded in the Hebrew Masoretic and Greek Majority (or Received) Texts, and that it can be read and studied in faithful Bible translations, such as Luther’s German Bible, the King James Version and New King James Version of the Bible, and other faithful translations. We reject and discourage the use of texts and translations of the Bible which are unfaithful and thus corrupt the Word of God (Deuteronomy 4:2; Jeremiah 23:28; Matthew 5:18-19; Revelation 22:18-19). Since all of the Bible is God’s true and unerring Word, we teach that the Bible is to be the source and judge of all Christian Doctrine. What is not in accord with God’s Word is not to be taught as Christian Doctrine (Isaiah 8:20; Jeremiah 23:28-32; 2 Timothy 3:16-17; Acts 17:11). The Bible is also its own interpreter; thus, passage interpretations which are not in agreement with other clear passages of Holy Scripture are to be rejected (2 Peter 1:20-21; Isaiah 8:20). We teach that the Bible is to be diligently studied and heard; for it reveals to mankind the only way of salvation, which is through faith in Christ Jesus, and it guides the Christian in living according to God’s Holy will (John 5:39; 20:31; 2 Timothy 3:14-17; Psalm 119:105).